The size of the bias tape maker varies, and the most common sizes are 12, 18 or 25 mm. First I thought that 12 mm is the size of the bias tape that the machine makes, but it it actually half of it, because the machine only bend the fabric inwards once. You have to bend the fabric the second time yourself – and press. Thus, a 12 mm bias tape making machine will actually make 6 mm bias tape and will use a 24 mm fabric strip. If you’re thinking whether you need a bias tape maker or not, buy this small size first – it would be more difficult to make this by hand (as opposed to 10 or 15 mm bias tape). Then you’ll be bale to decide yourself if it actually helps or you can do without. Since I was in full stash busting and scrap re-purposing mode, I was thrilled to use it for making bias tape. I soon discovered it is much more practical to use bigger pieces of fabric. It’s cool to use for small projects, like adorning the edge of a pocket, wallets or purses, or even doll clothes. 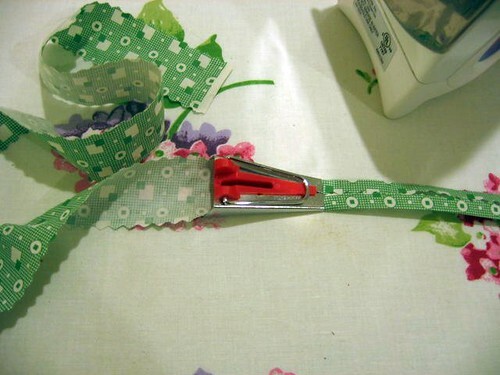 But when it comes for using bias tape for clothes, you’ll wish you cut a longer strip in the firstplace. If you have a lot of time in your hands you could try making multicolored bias tape by joining together multiple strips of your scrap fabric. But I suggest doing this for fun and not just before you need some bias tape for a project you’re working on. It will drive you crazy. While you could make bias tape out of anything that folds and irons, I suggest using natural fibers, such as cotton, linen, silk. They iron well, they keep their crease and they sew easier. The downside is that they are not very flexible, so if you’re using a cotton bias tape on a knit you have to understand that the fabric contrast will be visible. You can use it in your advantage and create new and exciting garments, of course, but it will not be discrete and it will not look like a bias made out of the same fabric. If you’re using synthetics, don’t forget you’ll have to press the fabric (which means the fabric must be iron-able 🙂 and that you will need the fabric to keep its crease to sew it easier. I was very happy when I found the continuous stripe bias method and couldn’t wait to try it. I think it’s good for smaller pieces of fabric that you’d like to use because they are awesome and the combination with your main fabric is fabulous. (Like a print with tiny flowers on a white cotton shirt). Otherwise, I wouldn’t sweat over it (again). I wouldn’t do the classic sewing of strips together either (unless absolutely necessary) and if I can’t cut on the bias, I will just cut a straight strip and fabric and that’s that. Hope this helps and have fun with bias tape.